I spent 90 phones on calls for the new Glenn hero and I should currently have about 196 new Glenn tokens.... but if I'm going to see my characters in training camp, I do not see Glenn or the new characters as seen in the @Pain_Walker videos. Go into your survivor list and click the TWD icon. This will show all heroes including the new ones. Here's a pic to make it clear. 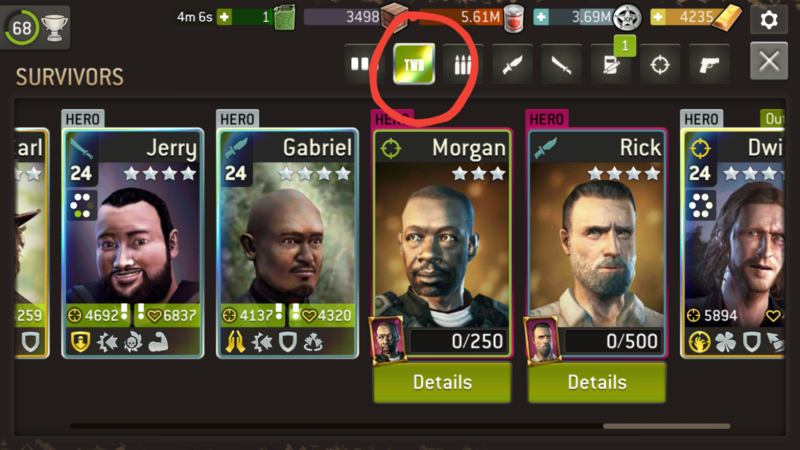 Click the TWD icon (I've circled red) & scroll to the right until you see the hero you'relooking for. Thank you, now i can see but I assure you, that a few hours ago i could not see.